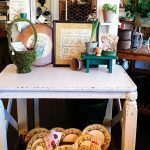 Posted April 24th, 2016 by Barb Stillman & filed under Exploring Arizona, Featured Shops. 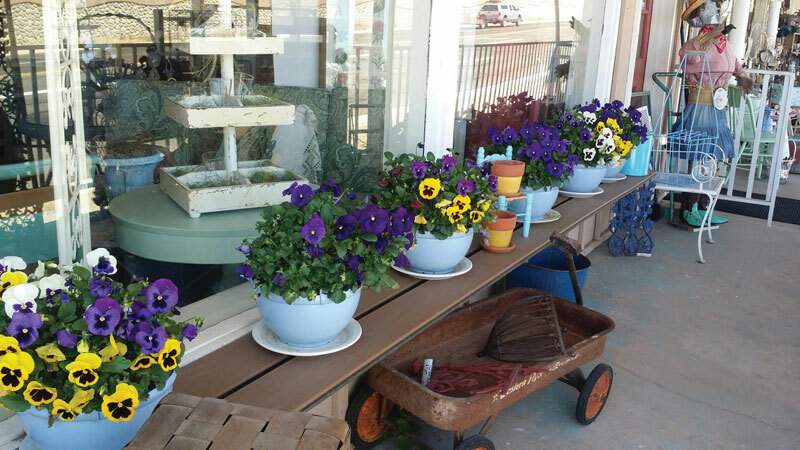 On a beautiful spring day, my sister Phyllis and I headed up to the Verde Valley to shop and explore. We had two specific destinations in mind—Camp Verde and McGuireville—but you never know what detour we might make on our travels. Our first stop was at Sweet Pea Antiques in Camp Verde. Since Phyllis had not visited this shop before, she was looking forward to exploring “new territory.” Owner Wynne Melton has brought together a wonderful group of unique collectors and artists so there are more than 40 vendors providing “over 5,000 square feet of pure fun!” We strolled through the store enjoying one interesting and unique display after another. Wynne and her vendors have recently ‘revamped and redone’ so the mall stays continually fresh and new. 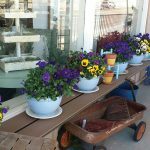 The front porch area is very inviting with pots of pansies mixed with outdoor patio furniture and garden items. Once inside, I fell in love with a beautifully handcrafted table that was in their front display area. I pictured it being used as a kitchen island or a high table with fun bar stools or even a standing workspace. It would have come home with me because the price was right but, unfortunately, I don’t have a spot to put it in at home—yet! We did manage to come away with some great finds. I found a vintage wooden alphabet/number abacus that is perfect for my kindergarten-teaching daughter-in-law, Amanda Stillman, to use to teach my 2-1/2 year-old granddaughter Harper and 10-month-old grandson Wyatt their letters and numbers. Phyllis found a ladle that she is going to use for a plant holder and two very nice, gently-used blouses. 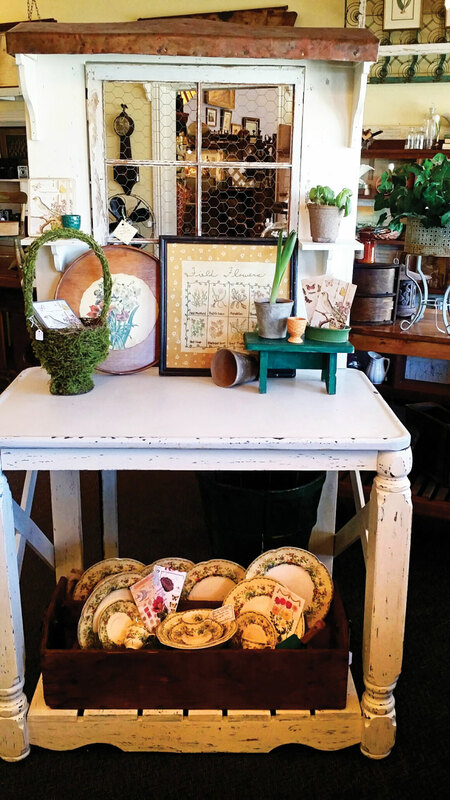 Stop in and visit Wynn and the friendly Sweet Pea Antiques’ vendors soon. 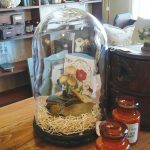 Located right on Highway 260, the mall is easy to find and is open everyday, 10 a.m. to 5 p.m. To learn more about their eclectic collections, go to: www.sweetpeaantiquesaz.com, follow the shop on Facebook and Instagram or call 928-567-6555. Our next stop was in Historic McGuireville where we visited Jim’s Trading Post. McGuireville is a hidden gem located on the east side of Interstate 17 at exit 293. 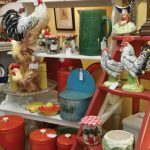 Not only is it a top antiques’ destination on 1-17 but there are also several incredible points of interest to be enjoyed. This area is steeped in a rich history along the beautiful lush banks of Beaver Creek. It is this riparian area that has beckoned travelers for many years. Jim’s Trading Post is so much fun to explore outside and inside. The outdoor yard is full of fun and funky signs, wagons, farm equipment and even an outhouse. There’s just about anything you can imagine—and more! Jim is fascinated by old buildings and wagons so you’ll find some on the property. 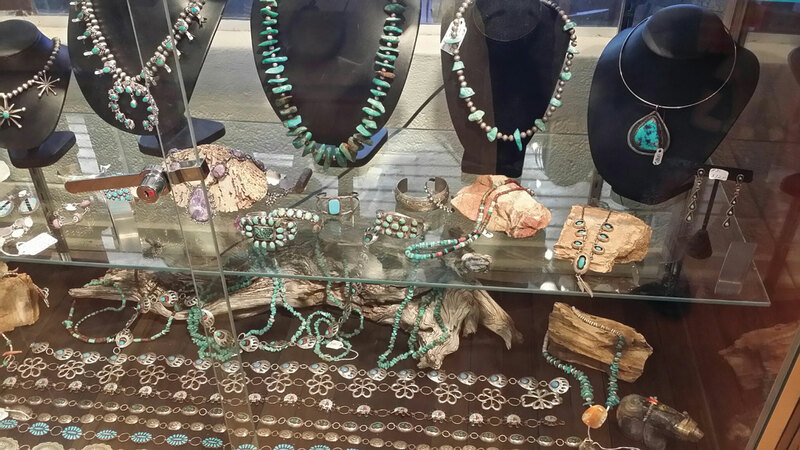 Inside, Jim has expanded his Indian jewelry collection, which is beautifully showcased in jewelry display cases in the front of the store. 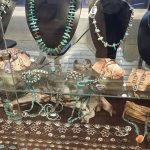 “We want our customers to know that we have one of the largest collection of Indian Jewelry in Northern Arizona,” Jim told us. We saw a beautiful coral bracelet that Jim told us is a very rare find since coral is no longer available. 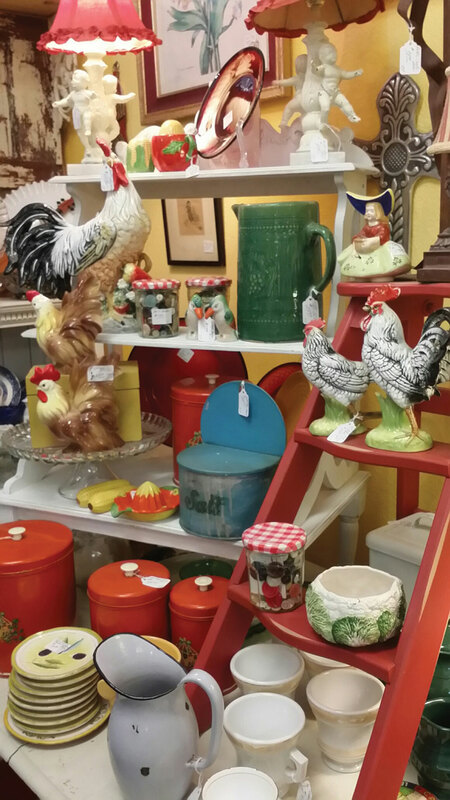 We strolled through rooms holding more antiques, vintage, western, art, “unusuals” and additional items from Jim’s own collection as well as from dealers. The open feeling highlighted unique collections and individual pieces. A true “people-person,” Jim enjoys meeting visitors and making sure they feel welcome. 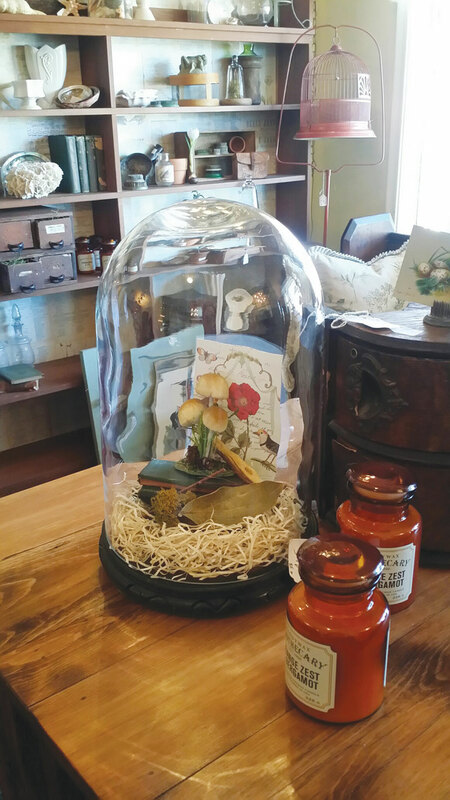 This enthusiastic owner invites The Antique Register readers to stop by Historic McGuireville and spend some time exploring the shops and area. 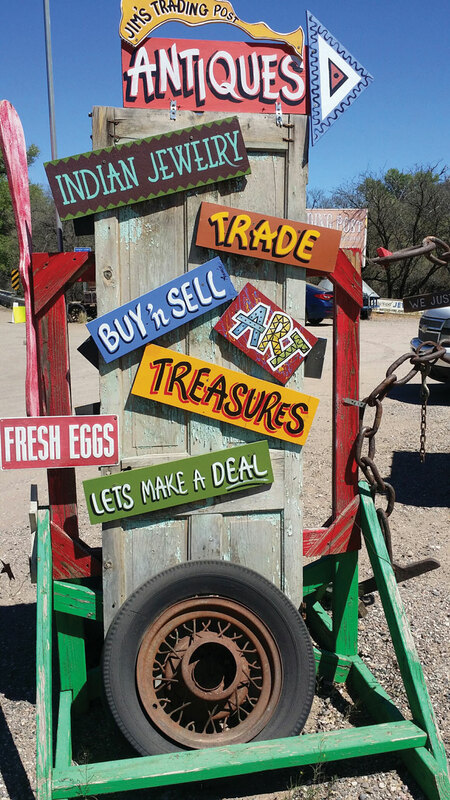 Jim’s Trading Post is open daily from 10 a.m. to 5:30 p.m. For more information, call 928-554-5916, email jimandrus@gmail.com or share in the fun at Jim’s Trading Post on Facebook. Next door to Jim’s is Second Time Around, a small historic structure full of antique items and collectibles. 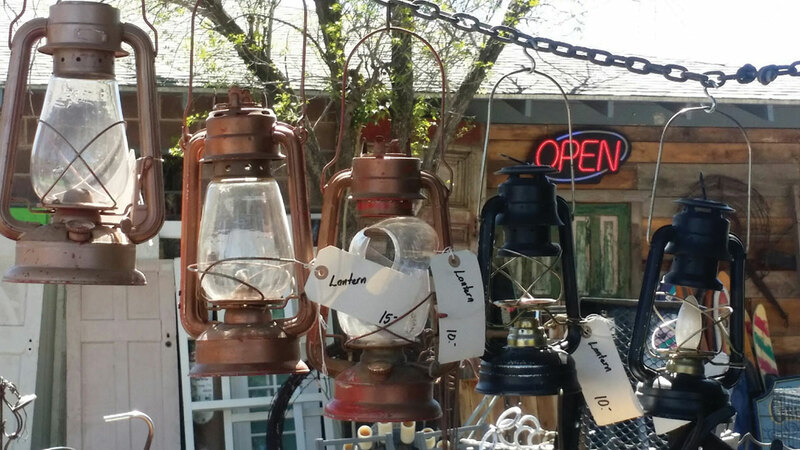 Because of the beautiful weather, several items were on display outside. A friendly group of people were sitting there enjoying the weather and each other’s company. 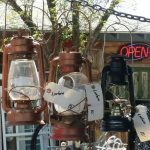 Across the road is Candy’s Creekside Cottage – Antiques & Collectibles, an antique store inside an antique building with quite a history! Originally built in 1932, it has always been a store and served as the general store for the Beaver Creek area until the mid-1980s. Next door is Dry Beaver Feed Store that you might not think to visit unless you are looking for animal feed—but stop and check out the collectibles in the back room. It was time for lunch and Jim had recommended RR BBQ, a local restaurant just up the frontage road, so off we went. We love it when our advertisers share some of their favorite eating places, especially when we’re from out of town. They usually know the best places to eat and we were not disappointed with RR BBQ! It was such a relaxing meal out on the patio with a cool breeze gently blowing that we hated to leave. 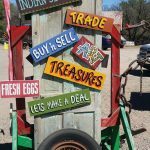 Both Camp Verde and Historic McGuireville are favorite destinations and we encourage you to visit and spend some time exploring the shops and area. They might just become one of your favorite stops on I-17. Be sure to tell them The Antique Register sent you!